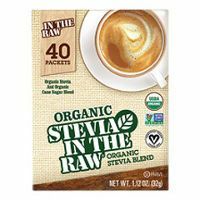 Stevia in the Raw® Zero Calorie Sweetener. Stevia blended with other sweeteners. Enjoy your sweet moments with Stevia In The Raw Zero calorie sweetener. Stevia In The Raw gets its bold sweet taste from the sweet leaves of the stevia plant, which grows naturally in the Americas and is now cultivated throughout the world.